On Tuesday morning, we hauled our laundry over to the little coin laundry we'd found about 400 m north of the ExCel. Another Loncon member was doing her laundry there, too. This was routine enough, and thanks to a 2 PM check-out from the Crowne Plaza Docklands, we did not have to rush to get it done. Our destination was the Intercontinental Westminster. I had a coupon from IHG for one night in any of their hotels. As with last year's stay in the Venetian, we wanted to use that coupon on the best in the chain if possible; however, I don't like doing single nights during a trip like this, so I also used points to get us two nights there. 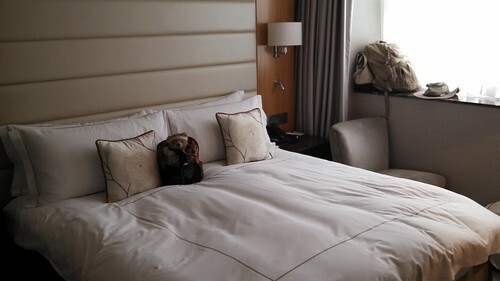 (I did not have enough points to make our entire stay in the swanky Intercontinental.) 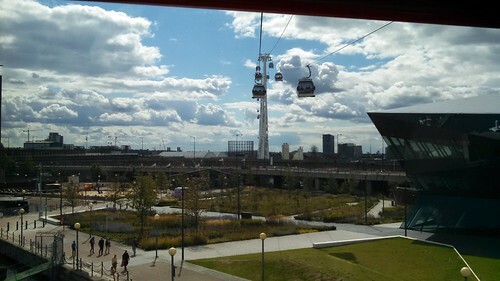 Checking routes, it turned out that the best no-stairs route between hotels was to take the Emirates Air Line cable car over to Greenwich and change to the Jubilee Line there. That means we needed to use the EAL as actual transit, not just an amusement-park ride. We checked out of the Crowne Plaza and trundled over to the EAL station near the hotel. As luck would have it, a group including Dave, Spring, Kevin, and Andy were there in line just in front of us. We waved to them to take the car ahead and not worry about us; with all of our luggage, we traveled heavily. 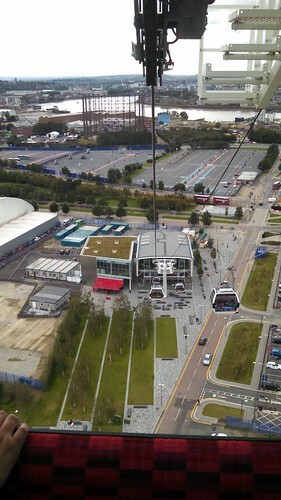 We soared high over the Docklands, and off to our left we got one last look at the ExCel. 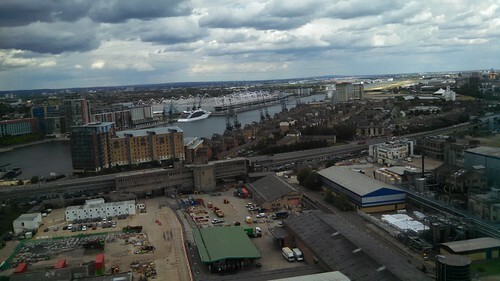 After our eight-minute "flight" with a peak cruising altitude of 90 m, we descended into Greenwich. On the way out of the EAL station, we waved goodbye to our friends and followed the signs to the Jubilee Line station, where there were actual lifts to carry us and our heavy luggage down to the Tube. 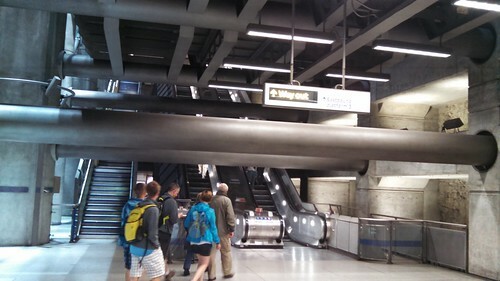 The Jubilee Line stations are spacious and well-appointed, as this shot at Westminster station shows. 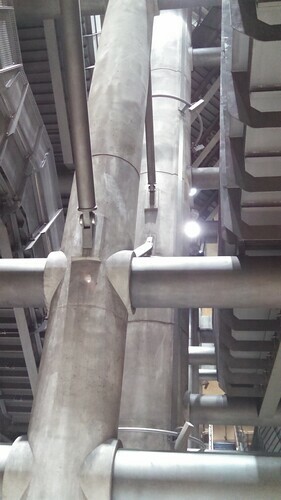 There are also huge pieces of support structure for the station visible. It's very impressive. Traveling off-peak as we did, the trains were not crowded, but there were definitely crowds at Westminster station across from the the Houses of Parliament and Westminster Abbey. I'd neglected to look for exactly where our hotel was, and there was some confusion as we worked it out. 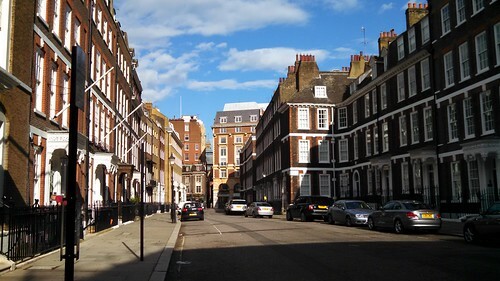 There is in fact a Tube station much closer to the hotel (St. James Park is across the street from it), but Westminster is the closest accessible station. We found our way to the hotel and checked in. 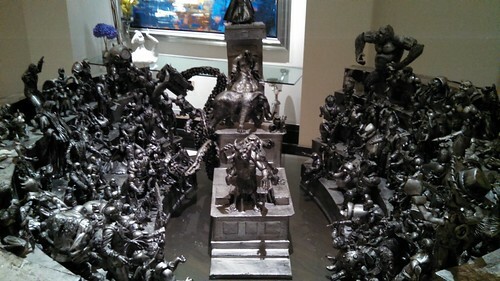 Lisa and I were most taken with this sculpture in the hotel lobby, which we both decided must be a rendition of the WSFS Busienss Meeting. Kuma Bear tries out the nice big bed. So far, so good. The work area is okay, and having a separately USB port for charging my devices is nice enough. I took all of the placards off the table and put them in a cabinet. Hotels give us work spaces and then clutter up those spaces with stuff. 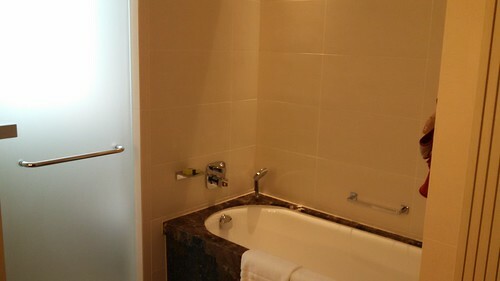 The room's bathroom is large and nicely appointed, with a separate shower compartment from the bathtub, plus an separate toilet cubicle. But the water is too soft, and a bunch of the controls in the room behaved oddly. There were banks of light controls that showed that the designer had his own ideas about what lights you should have on or off at any time. You couldn't turn individual lights on or off, just select groups of them with buttons at the bedside. 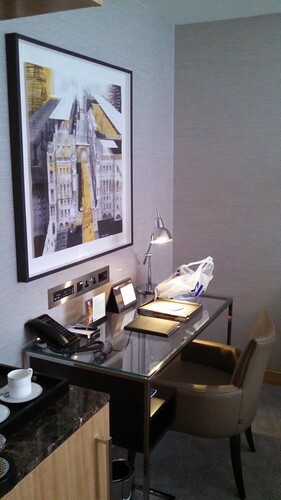 Although by central London standards, the IC Westminister room is big (and it's an upgrade from a standard room), I found the Docklands Crowne Plaza more comfortable and useful overall. I'm still glad we stayed here for the experience, and it's one unlikely to be repeated: next month the hotel rebrands as a high-end Hilton. After basic unpacking, we walked up Queen Anne's Gate to St. James Park. 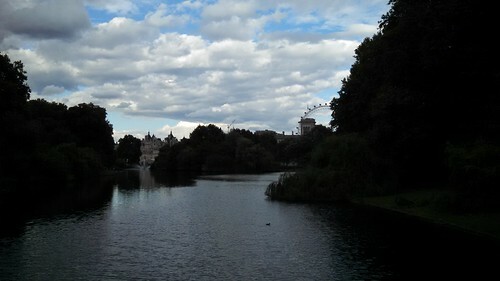 Here's the view from the bridge over the lake in the park back toward the London Eye. The wildlife in the park is fun to watch. The squirrels are so tame that they'll practically eat out of your hand. The pigeons are so fat they can't fly. Geese came over to us looking expectantly at us and seemed put out when we had no food for them. 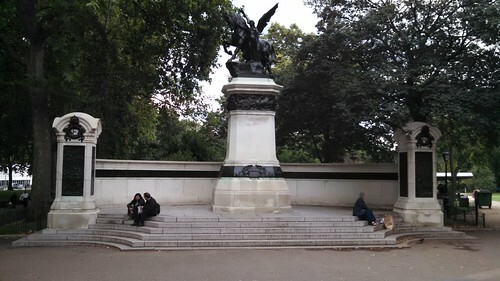 This is the Artillery Monument at St. James Park. We continued on past hear and across the street and wandered through the streets around Trafalgar Square. Having had only a couple of of croissants for breakfast, we were getting pretty hungry, and when we walked past the Sherlock Holmes Restaurant, we decided that we were game. 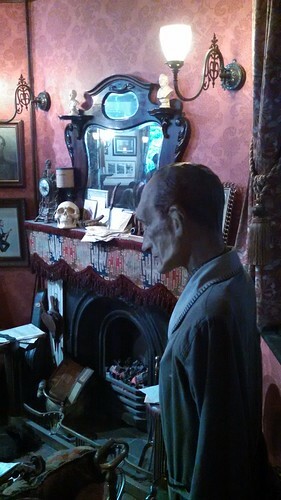 There's a recreation of The Great Detective's study in the restaurant, and the food was pretty decent as well. I'm trying to not think too hard about the prices, though, other than to continually think the prices would seemm more reasonable if those were $ signs instead of £s. 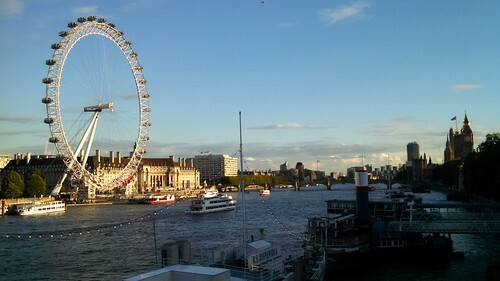 We walked to the Embankment and crossed over the Thames, where the London Eye was well lit by the setting sun. When we got over to the far side of the Thames, who should we happen to encounter but the same group of our friends who had preceded us over the EAR? We left them looking for somewhere to each and checked out the amusement center there, because our London Pass apparently includes some tokens to use there. 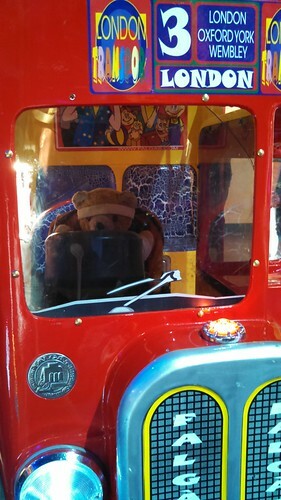 The Fun Center didn't look very fun, but we found this little bus that was just the right size for Kuma Bear. 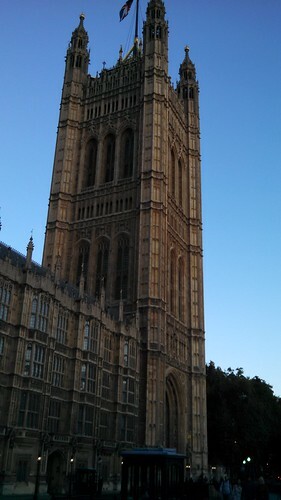 We crossed back over the Thames and walked over to Westminster Palace (Parliament). 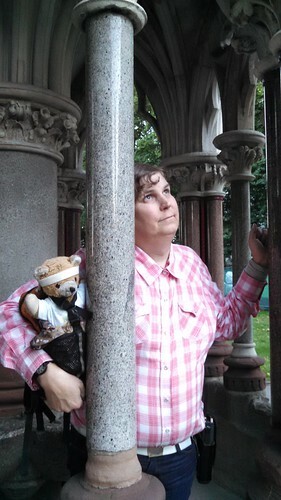 The Victoria Tower and Lisa standing with Kuma at the tower's gate. We continued into Victoria Park, where this little building caught our eye. 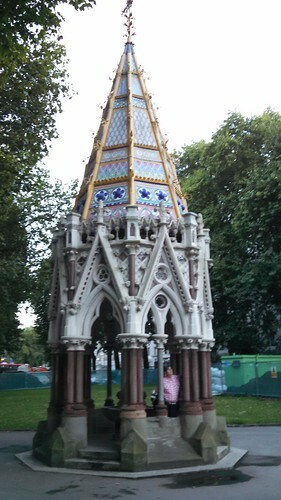 It's the Buxton Memorial Fountain</am>, originally built as a memorial to the emancipation of slaves in the British Empire. It's a tiny building. 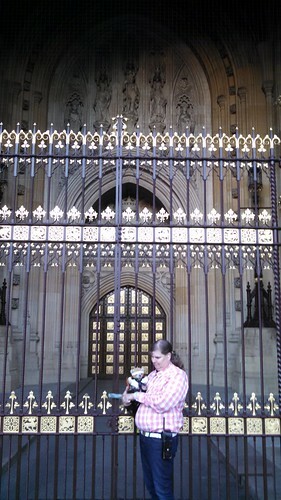 But Lisa and Bear fit in it much better than they did at Westminister. Then it was time to try and find our hotel again. On the way back to the hotel, we stumbled onto the offices of the Department for Transport. 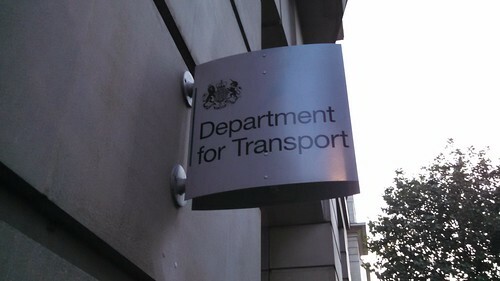 Considering how often I read about the DfT in RAIL magazine, I figured I ought to photograph the building as well. 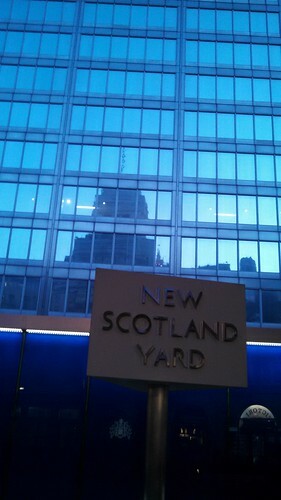 And speaking of places I've heard of, we came upon the iconic New Scotland Yard sign, and found that it was just around the corner from our hotel. Many more photos are in my Flickr Album. I continue to run at least a day behind posting, becuase writing this up properly seems to take a couple of hours, and those are hours I really should be sleeping. I hope I'm this tired when I get on the flight back to the USA next Tuesday.